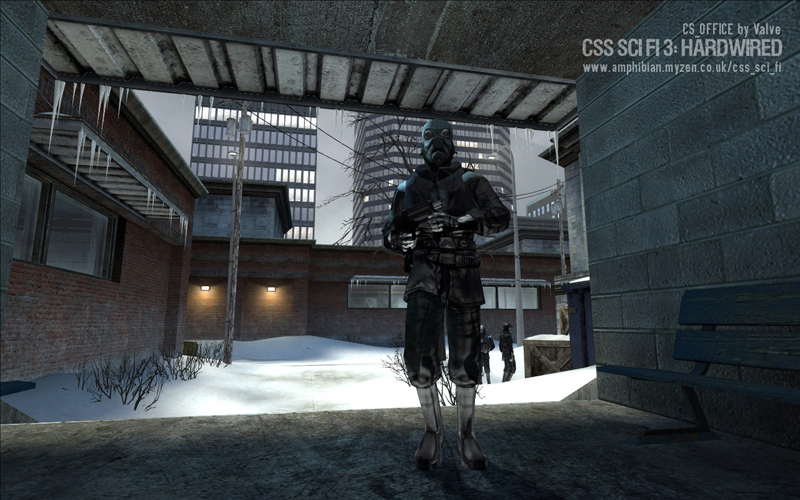 CSS SCI FI 3: Hardwired is a single-player modification for Half-Life 2. 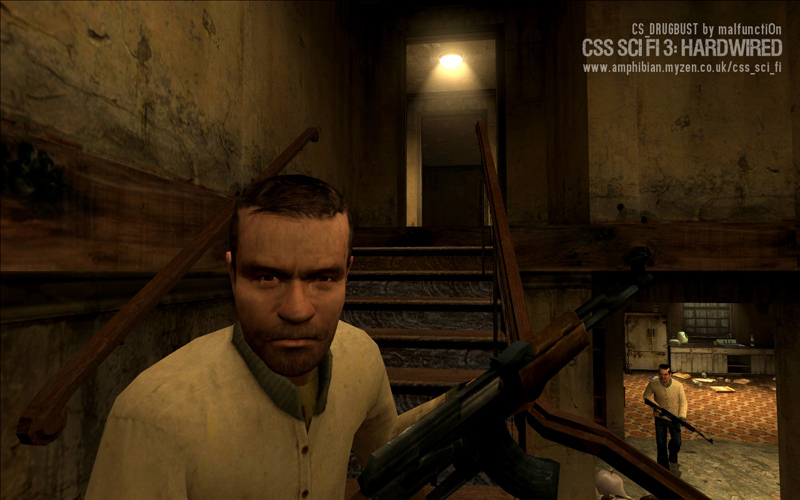 Waking up to find himself an augmented clone of Gordon Freeman, the player must fight time-travelling Combine forces and other enemies across 42 unique and re-playable missions. 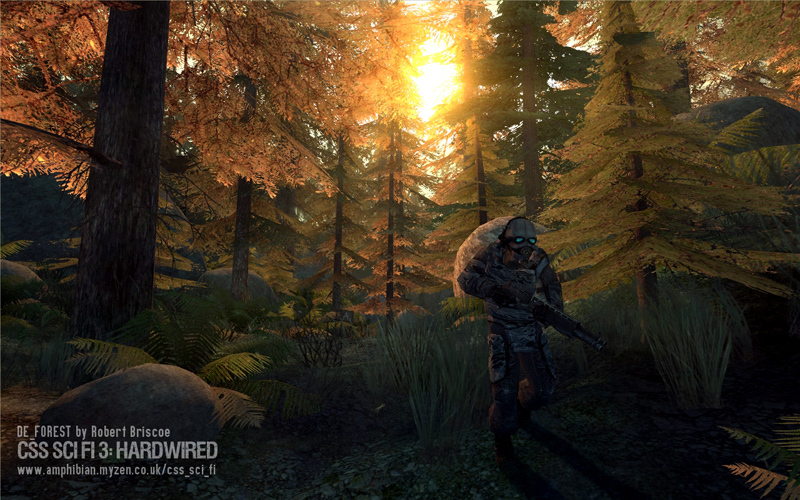 Players enter each map through the mission hub and can choose to play each one at a time or all in 3 linked campaigns. 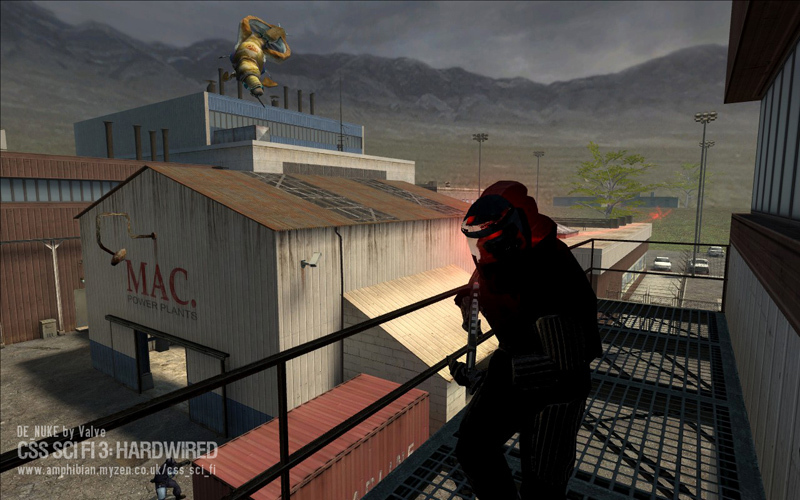 Each mission features a series of goals, such as to rescue hostages or destroy targets, which must be completed to move on to the next map or return to the hub. There are multiple approaches to each goal, and in each map the behaviour and armament of enemies and the distribution of resources are randomly determined within defined parameters. Thus, no two plays are the same, making CSS SCI FI a truly re-playable single-player experience. Requires Source SDK Base and Counter-Strike:Source. 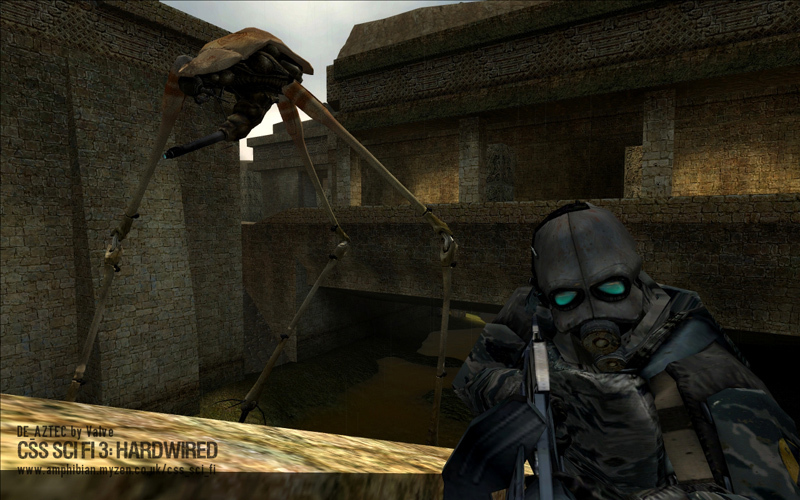 Retains look and feel of Half-Life 2 while adding new weapons, enemies and abilities. Includes a custom mission hub, weapon test range and full configuration utility. 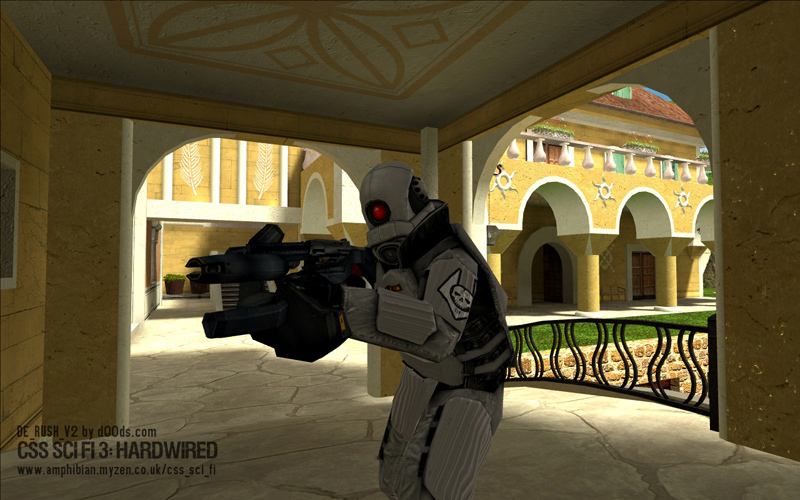 Includes 24 custom maps for Counter-Strike:Source. 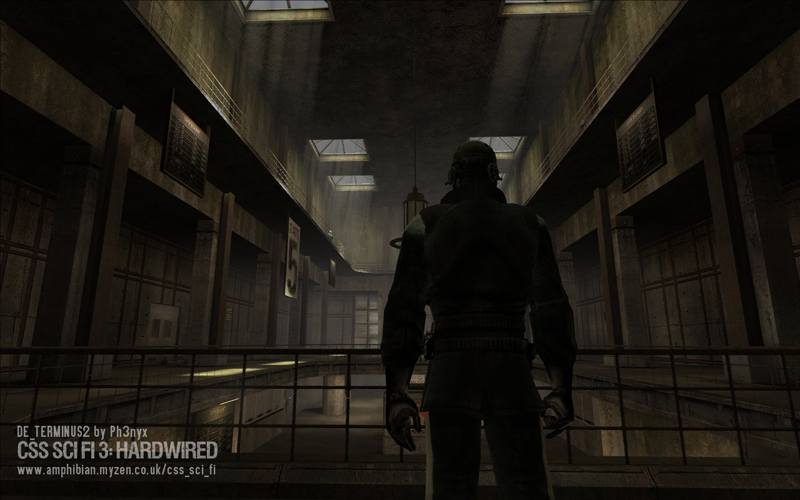 Features 42 replayable non-linear missions, each with multiple goals and hidden secret weapons. Support for 64 bit systems and non-standard Steam locations. 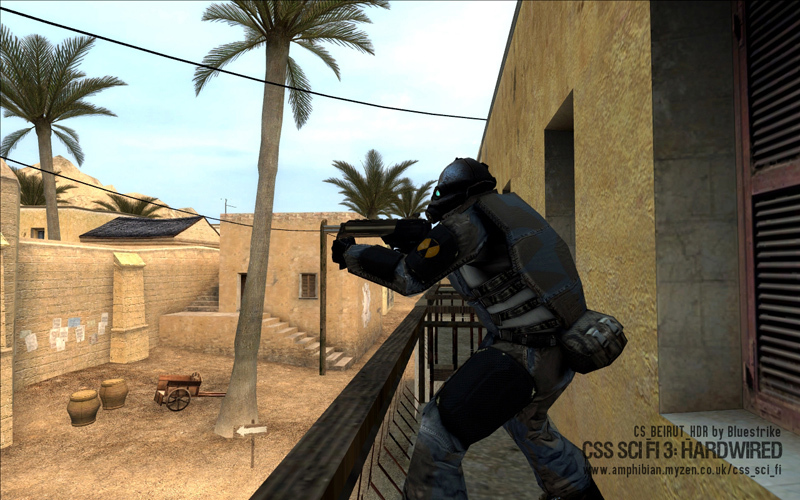 Now runs on the Source SDK Base, meaning that only Counter-Strike: Source is required. UAC support for Windows Vista and 7. Updates to the translations .csv (get this version if working on a translation). Ensures that Steam and CS:S are installed. Locates the user’s SourceMods directory, creates a new directory for CSS SCI FI, and installs the mod resources within it. Locates the user’s cstrike/maps folder and installs 24 custom Counter-Strike: Source maps within it. 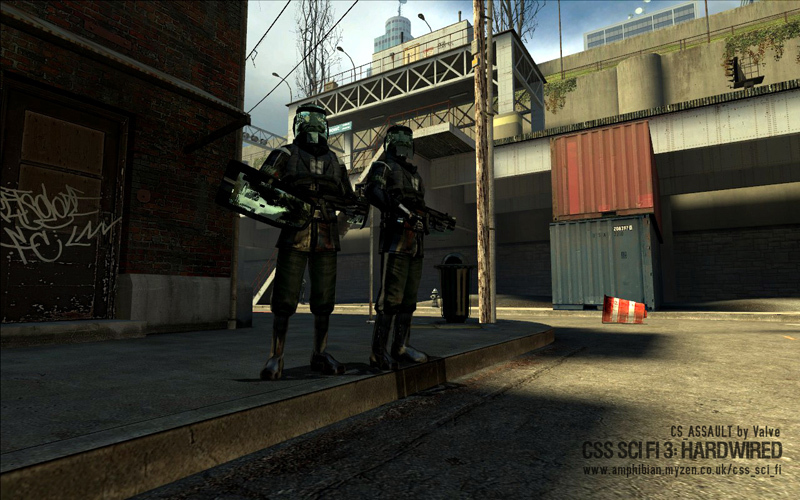 Sets up script files within CSS SCI FI to link the mod to the user’s cstrike/maps folder. Executes the CSS SCI FI Configuration Utility (see below for more details). The process is safe and causes no other changes to the host system. The CSS SCI FI Configuration Utility is included in the mod installation. 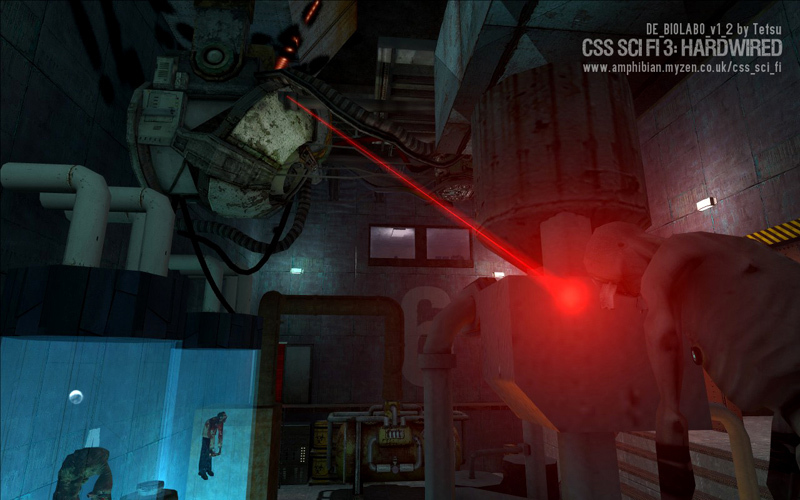 This program allows users to select and install 48 different game options, each of which may affect the difficulty, graphics, enhancements or gameplay of CSS SCI FI. 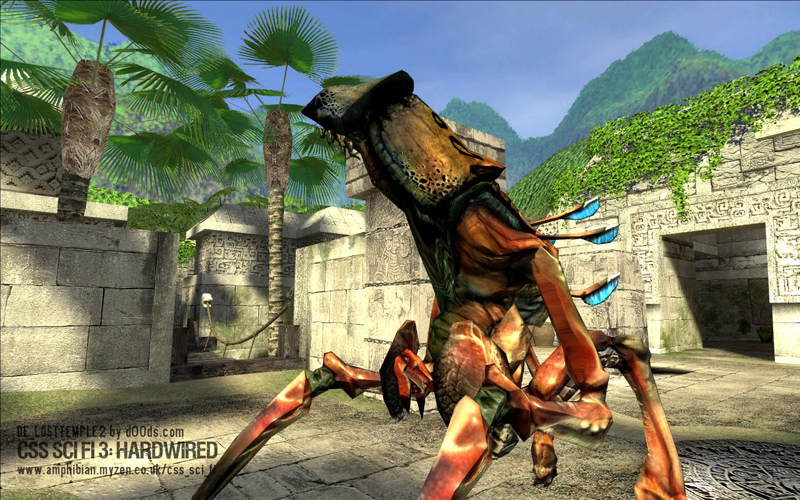 These options are independent of Half-Life 2”s standard in-game graphics and difficulty settings, and can be selected in any desired combination. After the Configuration Utility has been run, you do not need to run it again until you want to change a setting. The Configuration Utility can be run at any time that the game itself is not running, and can be accessed using the launcher from the desktop or from the mod directory located at SourceMods/CSS SCI FI. For more about the CSS SCI FI Configuration Utility, please see the CSS SCI FI Configuration Reference Manual. 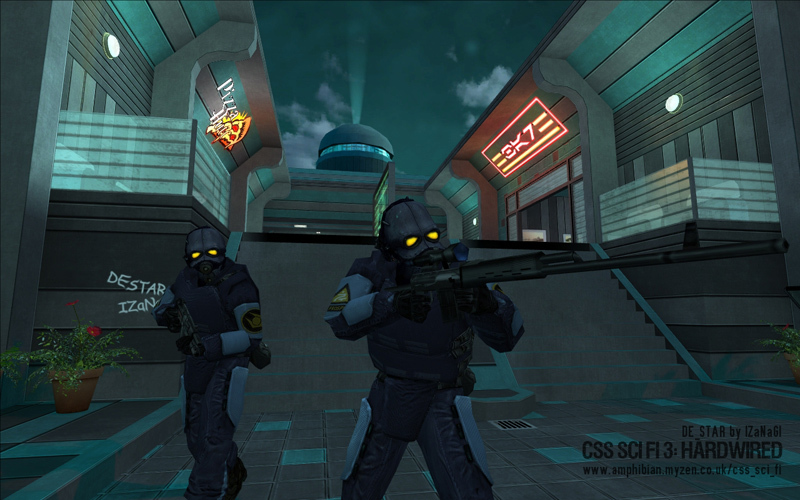 From Steam: CSS SCI FI will appear in the Steam games window as “CSS SCI FI 3: Hardwired”. The game can be started from this window as normal. From the Configuration Utility: When running the CSS SCI FI Configuration Utility, check the tickbox on the last page to “Start CSS SCI FI”. The game will start after the utility closes. From the desktop: Double click the “CSS SCI FI HARDWIRED” shortcut on the desktop. Tick the option in the launcher to “Launch CSS SCI FI” and click “Go!”. The game will start after the launcher closes. 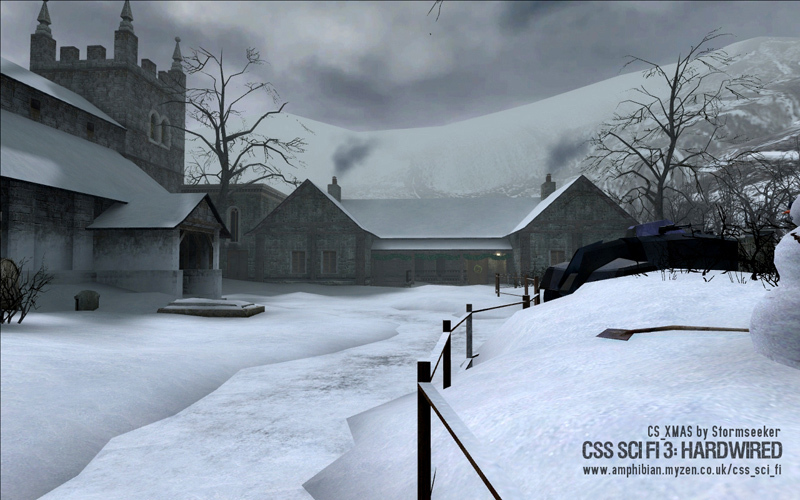 CSS SCI FI 3 can be removed using the included uninstaller. This is located in the mod directory (SourceMods/CSS SCI FI) and is named uninstall.exe. Executing this program will remove all installed and auto-generated resources, and will optionally remove saved games and screenshots. 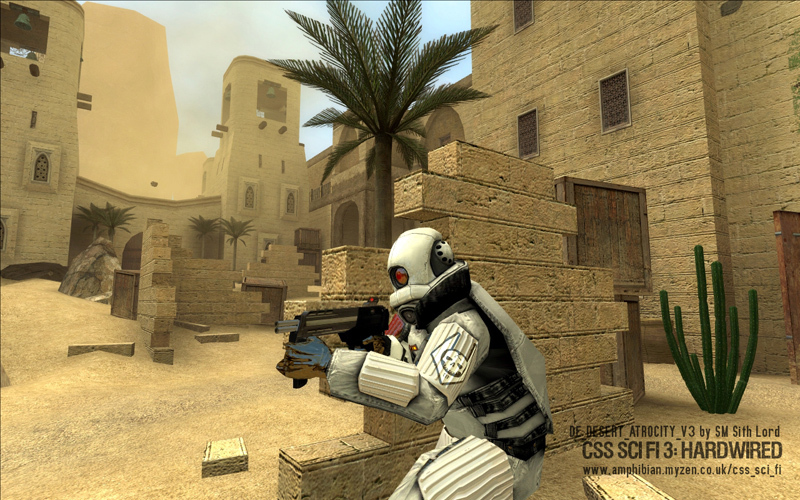 Users may also optionally choose to remove the 24 custom Counter-Strike: Source maps included in the original installation. 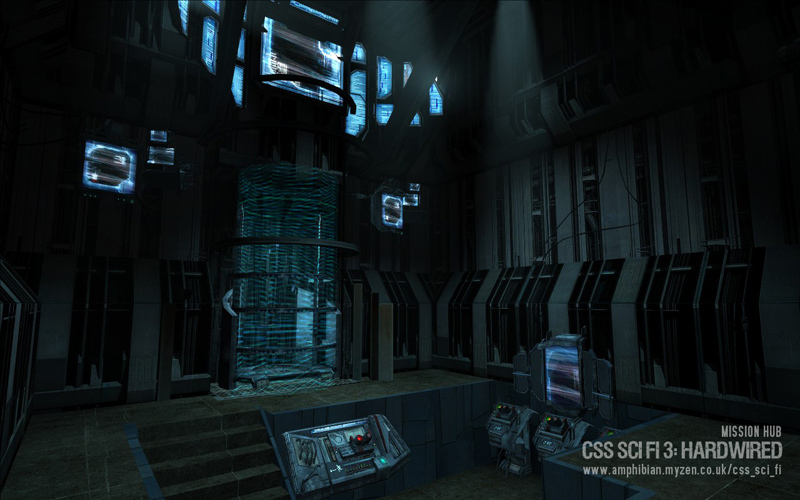 After uninstallation is complete, users may need to manually delete the CSS SCI FI folder from the SourceMods directory if it is not removed automatically. It is recommended that users exit Steam before running the uninstaller. All Versions: This patch fixes the crash after Compound caused by fatal incompatibilities in the following retail maps: DE_Dust, DE_Dust2 and DE_Inferno. This patch is required for all versions, including 3.02 complete. Run the executable installer and specify the path to the main CSS mod folder. Version 3.0 – 3.01: If you already have version 3.0 or 3.01 this small 1.4MB patch will update it to V3.02 without having to download the 322MB V3.02 full installer. Run the executable installer and specify the path to the main CSS mod folder. This patch fixes two reported errors in missions for CSS SCI FI 3: Hardwired. These include Cobble (fixed crash when attacking APCs during bullet-time) and Aztec (fixed rare bug which prevented the mission from completing). If you are having problems, or want more detailed information about the mod or its various patches (and any recent updates) it”s well worth visiting the Author”s CSS SciFi homepage which is both clear and concise. Each images comes from a different mission and one is from the Mission Hub (image 13). It’s hard to know where to start with a mod like this. I can’t do it justice really, so I will keep it short and to the point. If you haven’t already realized this mod is VERY different from anything you have every played. Not only can you replay it often but the basic style of allowing you to choose individual mission or play through campaigns is fantastic. Then there is the fact that you can change the configuration of the gameplay to plenty of different combinations, which will provide you with almost endless challenges. 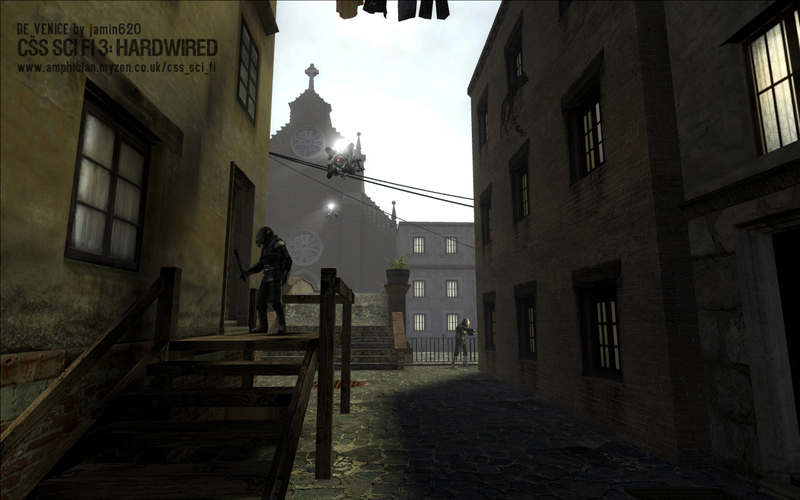 With some of the best looking maps ever made for Half-Life 2, the visuals are a treat. It’s pretty intense most of the time and whilst the mission give you breaks, when you are playing you rarely have time to relax. Most maps are non-linear due to there original design objectives and this adds even more variety to the gameplay. I’d be very surprised if this isn’t enjoyed bu all players, as it offers something for everybody. Fantastic, clever and downright enjoyable!. Is there any way to bring up a map for levels cos” I’m getting lost alot. Where is the best (and cheapest) place to get CS:Source then ? ‘scuse my ignorance here !! Under normal circumstances, that is correct, and I have a Steam account. However, when the installer is actioned, it immediately states that CS:S is not installed and action terminated. Polo, is CSS installed correctly and has it been run at least once? That is precisely why I asked where I can get CS:Source from and cheaply. When I double click the Hardwired installer, it fails to find CS:S.
Steam offers CS cheaply, but I don’t know which one to choose. Sorry, I thought that was a different commenter. I suppose the best choice is to buy it on its own but the other value packs seem better value. You could try Ebay or Amazon. Are you using “Orange Box” or an older version of HL2?? I still have my old version of HL2 and it’s not there! It’s all there with “OrangeBox”!! I have “Orange Box” and all of the older Half-Life stuff on Steam. When I look at the files on hard drive under Steam, there is nothing regarding CS:Source at all. Even had a look at the Orange Box disks to try and find it. I will put it down to a conspiracy (lol) and get it some other way. I don’t believe that The Orange Box came/comes with CSS. You’re right, it doesn’t. By the way, would it be possible to upload the mod to ModDB? Or is there some reason why that would be an issue? 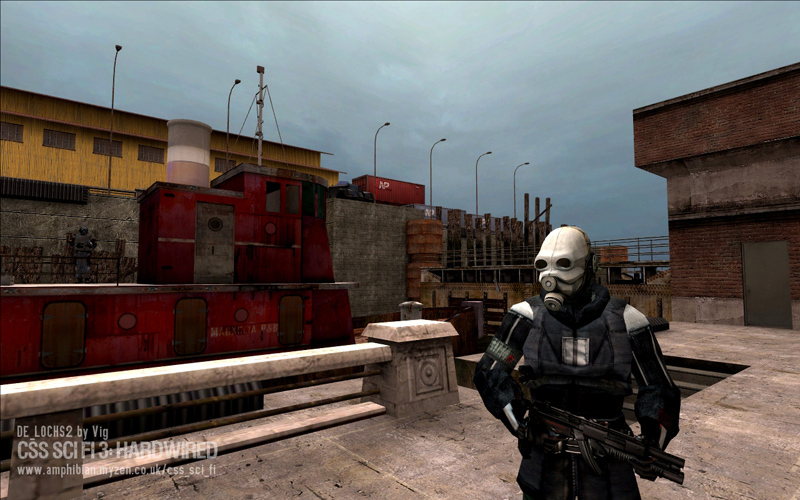 It seems like most of the HL2 mods I’ve seen, except possibly SMOD:Tactical are hosted there. It’s on ModDB already. Are you having any issues with my servers? If you have a Steam account, Counter-Strike: Source is free, I think. Do not remember paying for it. CS Source costs about £14 on Steam. You probably got it bundled with HL2 and Deathmatch Source like me. bah, I hate it when a mod requires 2 games that are both fundamentally DIFFERENT from each other. I’m so glad Black Mesa did NOT go this direction. Then again, the name of the thing IS “CSS” blah blah blah, so it’s not like it’s unreasonable to expect this to be targeted at CS:S players. Either way, I’m probably not going to be playing this. While it sounds good, it’s not necessarily one that looks like it’s going to appeal to my interests, and certainly not enough to warrant the purchase of a game I have ZERO interest in to be able to play it. Comapring this to BMS is a little unfair, although I understand your point. The difference is that it uses the CSS maps and that’s a basic concept. WHereas BMS was going to use some assests etc. Whilst it would be cool to not require CSS there would be no mod without it. So am I to understand Phillip that if you don’t have CSS, your out of luck? 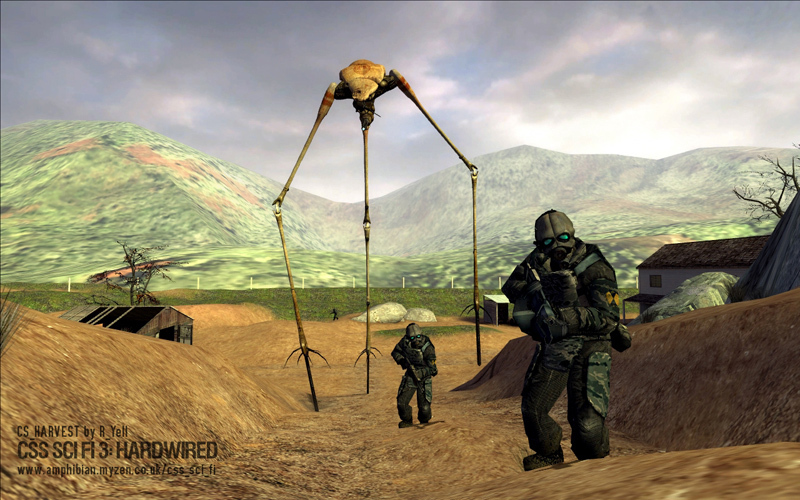 Is there any chance it could be reformatted to just Half Life 2? Absolutely none at all, I’m afraid. It uses maps from CSS and custom CSS maps. That’s the whole point. Hi everyone. Thanks for your comments on CSS SCI FI 3: Hardwired. It’s been a long time in the making and it’s great to see it released. 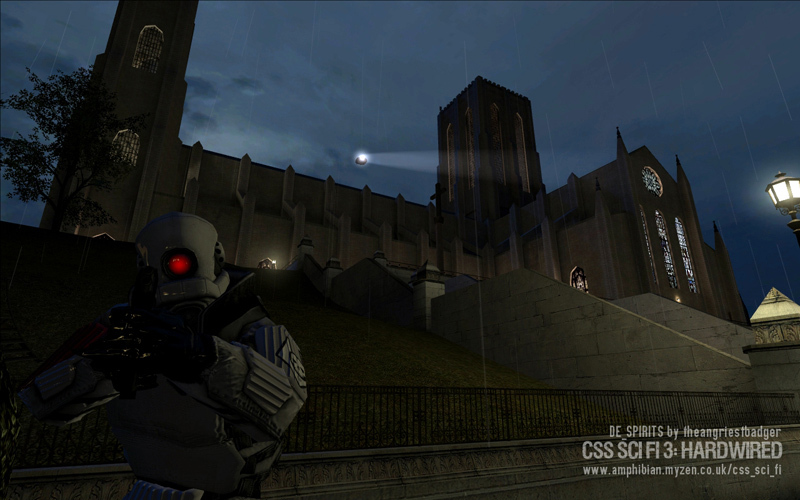 -There is no possibility of a version that does not require a legal copy of CS:S.
Hope that helps, and enjoy the mod. Downloaded, installed without a hitch. Very innovative. Strange to play “de_dust” map on SP mode. But it works. The Training is well!?!?!?cool. Looks like CSS is currently $20 on steam, so I think I’ll be passing. 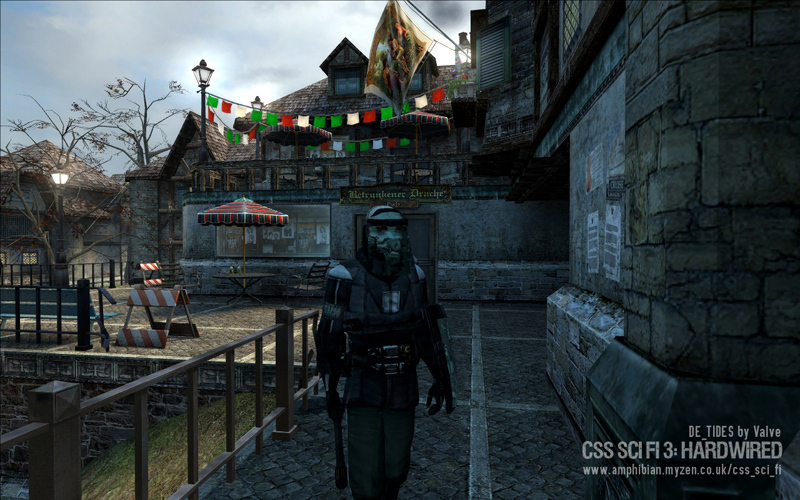 I’d suggest a HL2-CSS designation rather than the “Half-Life 2” I see next to the mod title now. I know what you mean but this is a one-off and no other mod requires CSS, so I don’t want to change the convention. Up and running, enjoying ever second of it. great mod, with a simple basic idea: take a counter-strike:source map, spice it up with ammo and health packs, add a number of npcs and combine forces from the hl universe, ENJOY. i played the 2.1 version now I started v3. 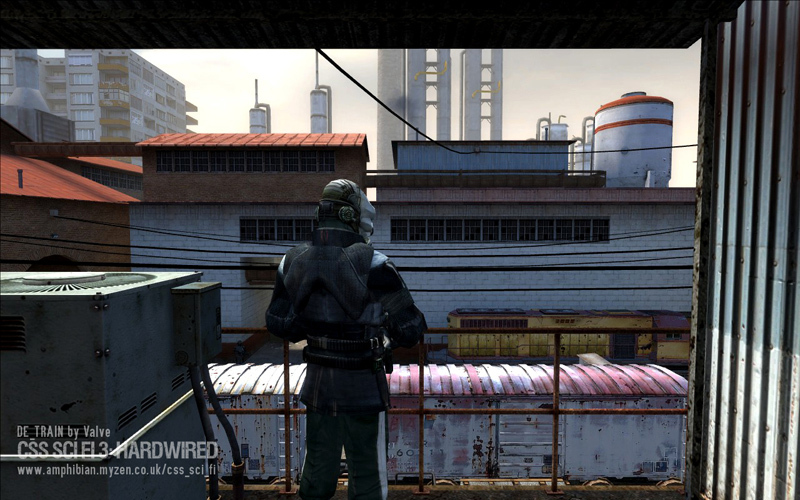 it is a must-play for both hl2 and cs:s fans. 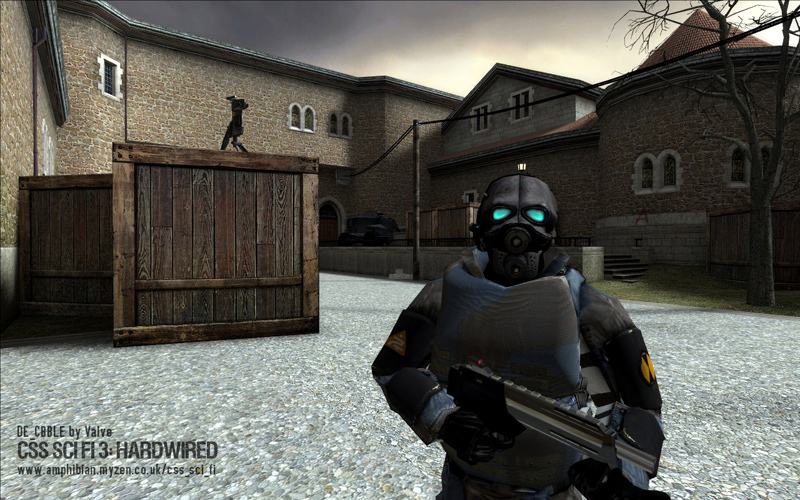 Got CounterStrike: Source from Steam last night. Played about an hour of it. Love it !!P.S. Thanks to everyones input, appreciated. I don’t see myself as spending 20 Bucks for a game that I won’t play. 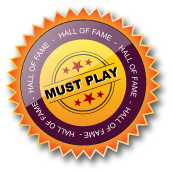 I don’t like multi-player games. Unless there are more SP mods for CCS? Anybody know? I don’t speak for the author, but I have no doubt that he didn’t intend to encourage the purcahse of CSS just to play this mod. There was a time when that when you bought other games you got CSS free. I certainly never bought it but have, I suppose a bit like TF2. There’s an idea: TF2 SCI FI. Play single player mode with all the weapons in TF2 style maps. I can’t believe there are so many people here who don’t already have CSS. I lucked out, CCS came bundled with HL2 when I bought HL2 back in 2004. 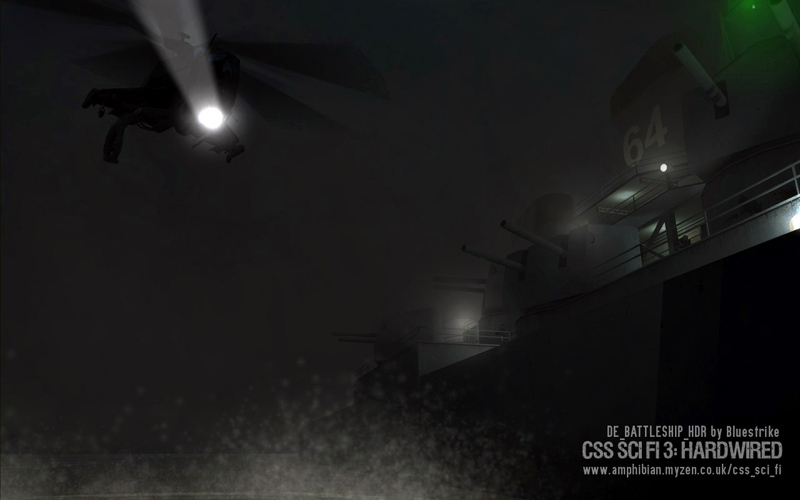 I played the first CSS SCI FI awhile back and to say the least I was impressed with it. This one looks to be much better, can’t wait to play it but I have to finish some other games and one MOD (Strider mountain) first, before proceeding to this MOD..I don’t think CCS is free if you have a steam account..But I would check in “my games” tab to see if its there and waiting to be installed.. Which it probably is not if you didn’t get HL2 special edition..
cs:s is not free (15€/$). however many people have it as it was part of hl2 collectors edition and hl2 gold/silver/bronze. furthermore its on sale every year for one or two weekends for about 5$, and then its a bargain. in december it will be my 10th aniversary as a cs player, and its still one of the two games I play regularly (the other being dawn of war). if one wants to plunge into the mp world its a good choice, its relatively beginner-friendly (the game, not the players 8( ). what is the name of the server are you on ? Um, you left out “Game of the Year Edition” lol. Is there supposed to be a replacement model for the default Hl2 pistol? I saw the world model just fine, it looked like a Beretta, and it sounded like one, but it had the default hl2 pistol model for the view. I’ve just tried to install CSS SCI FI 3, and the installer says I don’t have STEAM, and quits. Which is odd, as I purchase, download, and play most of my games through Steam. Any idea on a workaround? There’s a lot more to the installer than copying files. This will give you a broken game. Can you please drop me an email to antiscope at gmail.com? I have a few questions that will help solve this problem. Probably I will have to upload a new version, but I need some more information first. I’m on 64-bits too but the mod loaded fine to my SourceMods directory in Program Files(x86). The OS is Windows 7. Marvellous maps indeed, many are truly gorgeous. I think these are maps for Capture the Flag, or Co-ops or DMs ? Beautifully, done and no bugs or leaks at all. You haven’t got time to find any leaks, the combat is relentless! None of the 42 maps are in any way connected to any other map. Most seem to be mazes (a little frustrating). 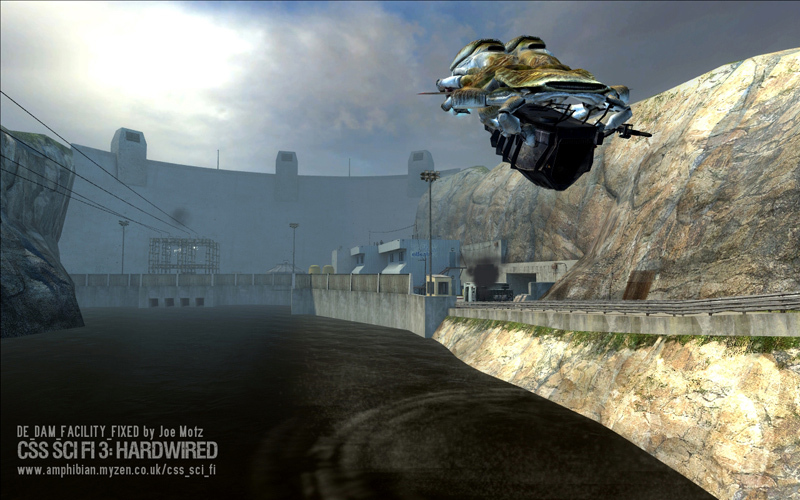 Arrive at the insertion point, complete the mission, go back to the insertion point and then start a new and unconnected map. They are all “run& gun’. I played a lot of these with earlier versions and learnt that I hate “Hostage Rescue” missions so avoided those. The rest were vast improvements over the old ones or were new to me. If, like me, you dislike “Hostage Rescue’, bewildering mazes and like to employ at least a little bit of strategy, you are best off playing the maps one at a time from the room with 42 screens. That way you can stop without having to finish a map you dislike. So avoid the metal door! No recommendation image because it is about individual game play tastes and each map needs it’s own recommendation. PINs: Rush, Lochs, Battleship, Dam Facility, Kenig Forest. Spirits, Night Fever, Ancient Town. The rest? They are all worthy of 3 stars or more but over to you! hostage maps can be annoying but you can (and need to) use the team commands on them like in hl2. you can leave them behind in a safe corner until you killed off the final wave of combine. getting close them but running away before they stand up also seems to work: this triggers the combine to come but the hostages wont follow you (im not sure about this but I think it happened a few times). this is a really well-made mod package, but it seems to crash my pc alot (6 times in the last 2 days of playing it, particularly in maps that have gunships). I have 1gb ram and 256mb ram on video-card, but that doesn’t seem to be enough. CSS Sci Fi Version 2 runs much better on my computer. I will send you back a link to a test version in the next few days, which you can try. This will provide better support for non-standard Steam install locations, and will allow users to point the installer at the SourceMods and cstrike directories manually. If all goes well, then this version will replace the current version. Those of you already running the game without any difficulty do not need to redownload the mod, as it is only the executables that will be changed. I’ve had a couple of crashes so far, once during a quick load after being killed by the explosion from the APC after blowing it up on cbble and once after blowing up bomb target B on the prodigy map (screen froze with the sound looping). Both of them had my game crashing back to the desktop after a few seconds with an error message basically saying that the game had stopped working. By the way, the hostage mode can be quite frustrating when the civilians block your path or run in front of your view – I accidentally blew the head off from one moron who ran into my fire; things like that frustrate the hell out of me. Wow! Another great mod to play through. It’s up and running with no problems so far. Thanks! Awesome work! I played an earlier version of this mod months ago and I have to say that everything about it has improved dramatically. The load times, the missions, everything is better. I especially like the new mission selection process. Very professional. Excellent job, fitzroy. This is proof that multiplayer maps can be turned into an enjoyable single-player experience. I would absolutely love to have co-op play as an option though, if that’s possible. Just finished all 3 campaigns and it was a very fun ride I must say. A bit disappointed that the third and final ending map was basically the same as the first one but what the heck, at least it had fireworks! The random crashes is what lowered the score significantly; if those would be fixed, or at least reduced, I’d definitely consider a “Play it Now!” recommendation for it, hell even maybe a “Personal Favorite”! Can you provide more details about your random crashes. Unless players who experience these crashes provide feedback they will never get fixed. I’ve already provided detailed feedback with my previous comment. Apart from being random, sound looping for a few seconds and crashing back to desktop with an error message saying that the game have stopped working there’s not much else I can provide. well sometimes some maps kicked me out to the desktop, so I have to reset the game and keep on playing, I think thats a kind of annoying crash, but nevertheless this mod is awsome, I think i’ll take long time to finish it!, but i’m enjooying it alot! If you can’t make a sensible comment, please don’t visit my site again. You clearly haven’t played it, therefore I have removed your recommendation image. loving this mod,played it through once but now upped the diffulcty level and started again.And trust me on this it really does make a differance,the enemy now track ya down rather than wait for ya plus they are much better shots making the bullet time an even more important addition to the game. cant recommened this highly enough,great mod cheers to all involved. 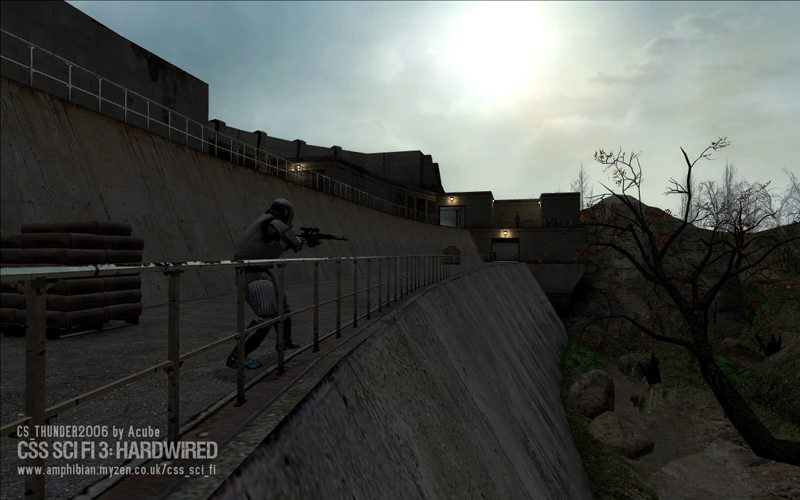 p.s would be cool to see a version using HL2DM maps. p.p.s cheers for using the utube vid I made philip,if your intrested Im making a couple more. Now well in to the 2nd campaign and still having great fun. However, I am still experience, has others random crashes, sound looping with freeze-up for a few seconds. Not much I can add to be helpful, none of these are repeatable the frequency of which is not spoiling the playing experience. Thanks for the comments everyone. I am hard at work on a new version of the installer which will allow you to specify your path to Steam if it can’t automatically be found, and will allow you to confirm your Counter-Strike Source install location. It should also now work on 64bit systems. There’s no new content, so when it gets re-upped you do not need to download it again unless you couldn’t install it the first time. -Like Phillip says, saying “it crashed” really doesn’t help me to fix anything. What I really need to see is a console.log, with the crash as the last line, and this needs to be emailed to me as per the instructions on my home page. If you don’t know how to make a console.log then see Steam Support for more information. However, nearly all crashes will be unfixable, as they mostly arise from a memory error in your computer (the program has asked for something it can’t get from the computer memory and then it’s curtains). There is nothing I can do about this, that’s just the way HL2 was built. @imadestroyer- Coop mode is often asked about but will never be possible. It would require a completely different codebase. @Loke-Sorry to hear about your crashes, but there is probably nothing I can do about it. I’ve done everything possible (as those that played previous versions can confirm) to smooth things out and reduce the load as much as possible, but there’s a limit! Also, congratulations on completing all campaigns! Yes, the third finish map may be a bit “woah dejavu” but this was not unintentional…after all, what’s an original experience for a clone? Basically, access the Windows Registry in Read-Only mode and readHKEY_CURRENT_USER\Software\Valve\Steam\SteamPath. This will give you the path from where Steam was run last time. No matter what, always ask the user where Steam is installed, but you should use this path as the default path. If it is incorrect then the user can easily change the path. If it is correct, then you only gave the user one more click. I think this is the best method. As for crashes. I don’t know if your mod uses custom programming (as I haven’t tried it or downloaded it yet). However, while you are correct that most crashes are caused by memory-corruption or invalid access of memory, these bugs are under your control. (Although they can be hard to fix in some cases, they are not impossible, unless it is as bug on the user’s computer, which is unlikely in 90% of the cases). To debug other people’s crashes, first make sure that your debugger works as described in http://developer.valvesoftware.com/wiki/Installing_and_Debugging_the_Source_Code . Then, more importantly, follow the instructions in http://developer.valvesoftware.com/wiki/Using_mdmp_files to learn how to use .mdmp (minidump) crash files to debug crashes that happened on other people’s computers, as if the crash happened on your computer. Make sure you have saved copies of the .pdb files for every release of your mod, and then if a crash happens, make people email you the .mdmp files. This should work in most cases and you will be able to easily detect the bugs” nature and with some effort, fix them. Again, you can fix the crashes, they are under your control, even if they are hard to fix. They are most likely your fault. It is not the way HL2 was built in 99% of the cases. Thanks for your comments. The dlls this mod is based upon are closed source. I cannot recompile them or debug them, and the original author, who gave me permission to use them for this mod, has stopped all development. So, while ideally much of what you say is true, there is nothing I can do about it in this case. In that case, there is little you can do. But for future projects, do not use custom dlls without access to their source code, always make sure your coder sends the code to you regularly (or using a content versioning system). This prevents you from losing the source code, and your programmer can’t go crazy on you. Sorry to hear you can’t debug the crashes. But I’m pretty amazed of the size of this mod. Hope I’ll get around to play it soon. Sortie said “always ask the user where Steam is installed, but you should use this path as the default path’. I agree with him as I don’t use my “C” folder for steam. Does this mean I won’t be able to play this mod? P.S. Yeah,I changed my mind, If I can install it in a different folder. I’ll pay for the game. That’s the wood map, right? I had some difficulties finding RPG ammo myself there; I originally thought that there was none so you had to rely on destroying the gunship with conventional weaponry, although that appeared to be an fruitless attempt. Anyway, I can’t remember exactly now but the RPG ammo box can be found on a high point with cliffs surrounding it; keep searching around the middle area of the map. Actually it’s not far from the rebel camp (100 metres?) – the sitting rebel’s feet point towards the RPG ammo chest. I’ve only just started playing this and the various locations are great with each level being short and sweet (although as has already been said I don’t enjoy the hostage rescue maps too much). Going slightly off topic, I like being to able to use Alyx’s pistol, but what is it based on? the nearest thing I know of is the pistol used by Robocop in the films. For the films it was a specially built prop using .22 short blank cartridges to get the sustained high rate of fire. So is there a real world gun it is based on? The author has alot of nerve expecting gamers to buy another addition to Steam to play this map. You should get in contact the author or contributor of “Strider Mountian. It runs, it’s a hit and no errors! It is difficult for me to comprehend the complaint that it is necessary to buy a game to play it, or in this case to play an extended work built on it, and then direct criticism at the person who worked hard without pay to make the game more accessible to players who prefer singleplayer style. To fitzroy_doll, I have nothing but thanks. I don’t think people understand that at least 50% of this mod is Counter-Strike content. The they should read the homepage or my page carefully. It’s fully explained. The author does not “expect” anybody to buy CSS to play his mod. In the same way that the SM team don’t “expect” anybody to buy HL2. It’s for people who already have it. I’ve also removed your recommendation images becasue A: I am not convinced you have played the mod. and B: Because you seem to be rating the concept not the actual gameplay itself. IF you have played the mod and hated it, please tell me and I will restore the image. I dont think he’s expecting ya to go out and buy CS:S.
I was one of the lucky ones who bought HL2 on release and it came with CS:S,and Ive played this mod and yes Ive crashed, but I crash in HL2DM as well but it doesnt mean Im gonna avoid it just cause of the odd crash. Loved it! I didn’t expect to as I’m not usually a fan of run “n” gun, but I really got into this set of maps. I’d never played any of the MP maps before so all the environments were new; I liked the strategic element of when do I rescue the hostages, where shall I get them to wait, when is it safe to summon them to the rescue zone; and I liked the new enemies too – the ninja-style Combine, the exploding spiders, and the laser-gun scanners. It must have been a huge amount of work to plot SP elements into these MP maps, so a big thank you to fitzroy_doll for hours of tremendous entertainment. That level of craftsmanship allied to well-designed maps really made for a memorable experience, and all the better for being unexpected too. I did a recent scan on the zipped mod using Kaspersky and it claims that there’s a rootkit in the installer and the uninstaller. Oddly, it didn’t pick this up earlier when I first downloaded it. Can somebody verify if it’s a false positive through Kaspersky or if the file really contains a rootkit? Well, my Comodo security software didn’t find anything, and nobody else has reported a problem. I personally vouch forthe author and the file – assuming you got it from me. There is no rootkit or any other harmful software in the installer. Your anti virus is giving you a false reading. 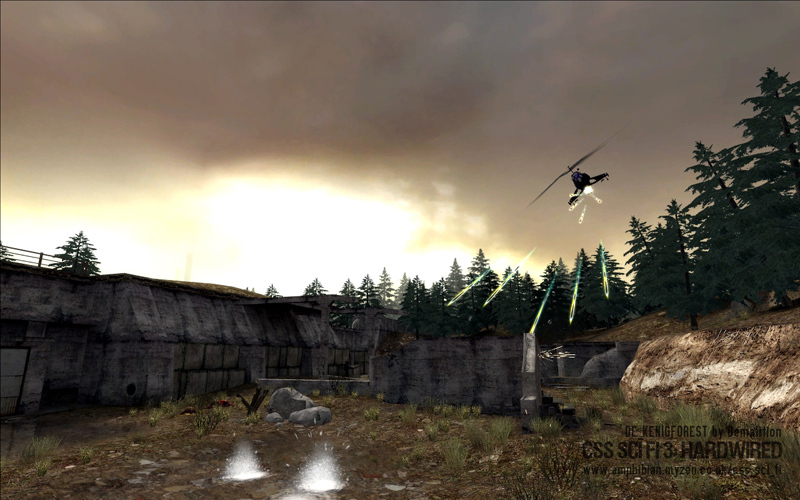 Use bullet time to attack the gunship closest to you as it makes its passes, then switch to the farther one when the first one is down. This is a false positive. There is nothing of the sort in the installer. Because the config utility, launcher and uninstaller are packed into the main installer your antivirus might be detecting the nested exes as something unknown, but there is nothing harmful in the installer whatsoever. Please see this link for more information about false positives relating to NSIS based installers. BTW, I was not the one who left the Anonymous post earlier. 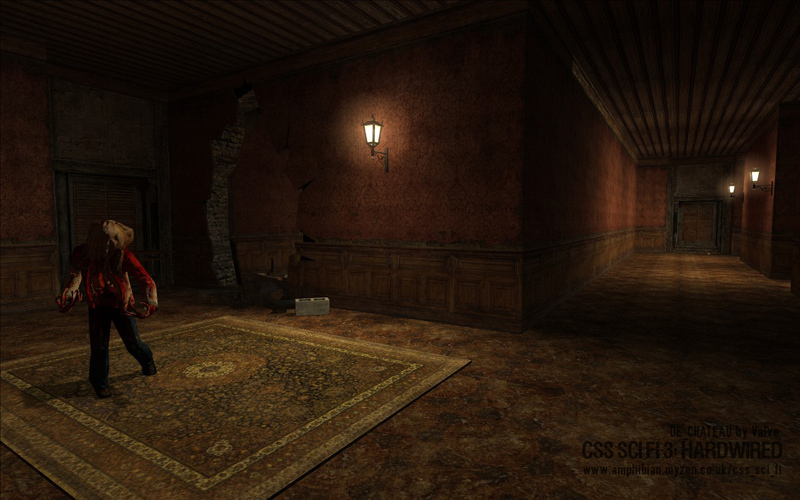 I have killed all the zombies in the chateau, but I can’t find my way to the black briefcase to save my life. I can see it… but I can’t seem to find a way past all the blocked doorways. Am I just dumb or is there a trick I haven’t discovered? there’s a switch on the second floor that opens up the gates, its behind the crumbled balcony if I remember. heh – I thought that might trip people up! I have permanent problem with unpacking the executable file. There is “CRC mistake” every time I try it. And i’m already tried different links. Besides, my internet connection is not working well during last three-four days – losing connection for minute or two, that type of thing. Could this be the reason for my problem? Anyway, if you know or just think you know the solution – be my guest. I am uploading a complete new file. So, if you wait about an hour, there will be a new download available. Thanks for uploading the final version Phillip. * Support for 64 bit systems and non-standard Steam locations. 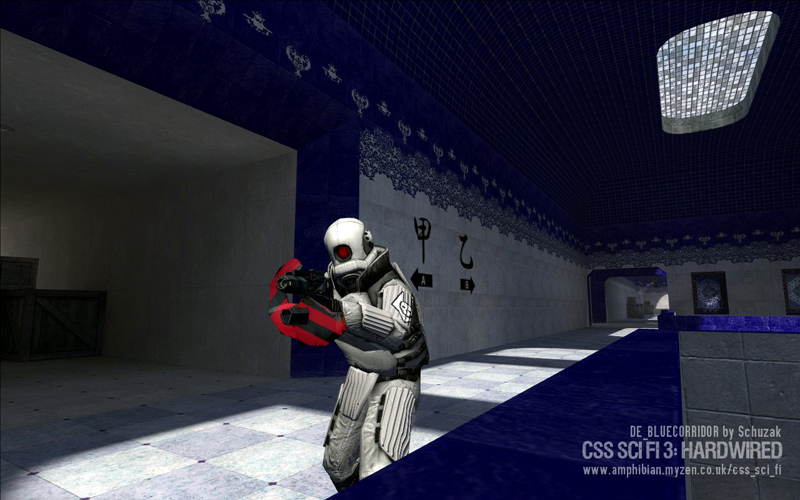 * Now runs on the Source SDK Base, meaning that only Counter-Strike: Source is required. * UAC support for Windows Vista and 7. * Updates to the translations .csv (get this version if working on a translation). * Faster loading times and minor bug fixes. darn no active links..sure would love to play this one. Currently uploading the latest version. It says that in the main post. Having trouble with my connection though. Keeps dropping. Second new link now online. Third mirror now online. Plus I have updated the features to reflect the new file in the main post. Thank you for the 64 bit support. I look forward to playing this mod! for a long time I am reading the comments here, and severel times I did watch the screens of this mod, and its amazing qua quality. what did hold me back not to download and play it was that I didn’t had CSS installed. to be honest was I to buzzy and lazy to do so. yesterday I decided to finally give it a try after installing CSS and I have to say, its even better as I had thought and hoped. first of all was I really very amazed by the way you made us players install your mod. the large menu that you get when you install it, with all the questions about how you like the mod to look and play is simply awsome !!! I really am yellous on it, would have liked to have a simular program for our sp-mod SM. I have played about half of all maps , and its great. it was hard to stop playing, this mod has something what makes you can’t stop, you’re interested in what the next map will bring. 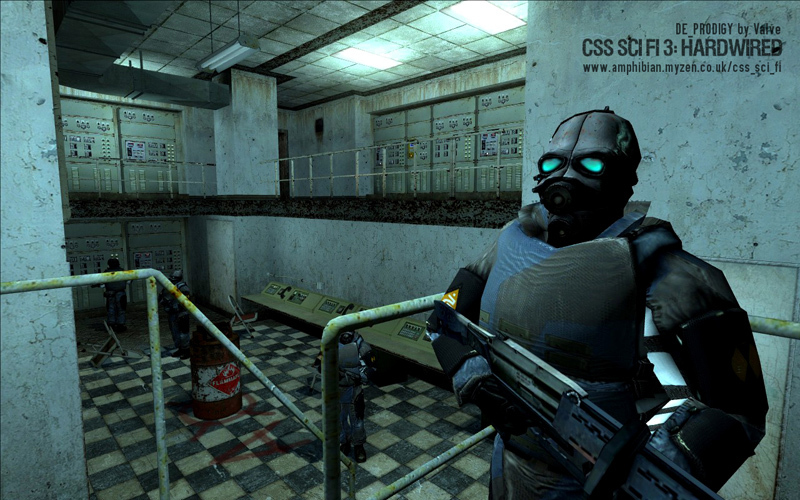 I am not a fan of CSS, because I don’t play mp at all, although I have played CSS for severel days when HL2 was first released. so I do get a bit back that feeling of playing CSS in those days, but then in sp form. i do like how the blood can gore can be improved, it makes it so much more fun. and all the weapons are great, although I personaly don’t like the different versions of the A2 weapon. but that’s just personal. seems I just downloaded it when it when reading, reading all the complaines above about the install. to me the install was very smooth and clear, it took a littlebit of time to get through but it makes that you can play right away ones you’re done, and that is nice. one other thing I did notice and surpriced me was that ones it was installed I could play right away, without having to close and open steam again. very nice future !!! again, I am quit yellous of your project !!! really well done, and as modder/mapper do I know how much work a project like this does take, even when you did use a small amount of original maps that were a bit rebuild. simply amazing you were able to pull this all of alone. again, great job and thanks for this great sp-mod !!!!! Is that possible to create some Ultimate Config Utility for ALL HL2 original episodes and mods? Which could detect installed programs and add or change some files in them to give them the list of possibilities of CSS: Hardwired? Because, just imagine playing the original games and other mods without HUD with regeneration and without crosshair and with improved raggdolls (they are awesome! )… well, you got the idea, don’t you? I’m not a bit a programmer myself, so that’s why I’m asking. I’m stuck on de_aztec. I’ve fulfilled the requirements but the level isn’t ending. Load the autosave in the beginning of the map and use trap ware (or whatever is it) only ONCE – at strider of course. And I killed strider before killing any newly arrived combines. I’m not sure what’s causing this (comments seem to suggest that deaths by hopwire don’t cause the npc_combine to fire the ondeath output, but I haven’t been able to replicate this), but I do know how to fix it. I’ll release a fix for this and the crash-while-using-bullet-time-in-cbble later this week. -Aztec mission does not complete (I was not able to reproduce this error, but believe it was caused by some deaths not triggering the ondeath output on some npcs. If this error occurs but all enemies have been eliminated, the mission will now complete after a short pause). 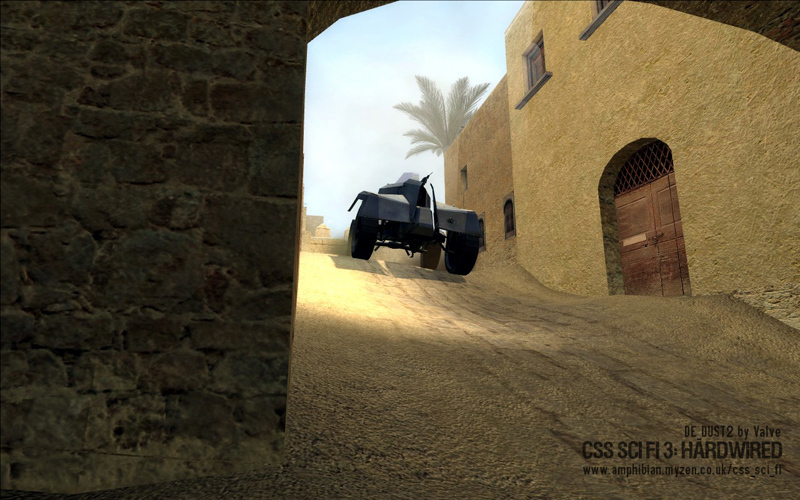 -Cobble APCs cause crash when attacked during bullet time (I was not able to reproduce this error, but the most likely cause has been eliminated). All users should download and install the patch. 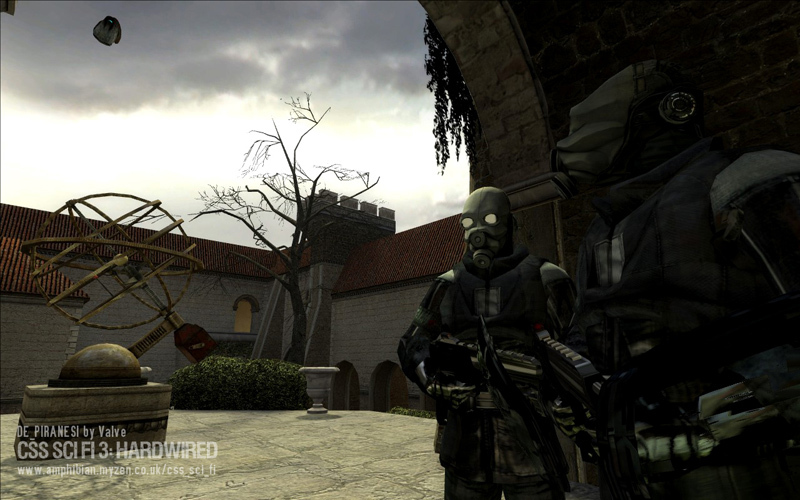 Users who are not running the final version of the mod (users who are still running the HL2-based version) will be prompted to download the final version (hosted by PP above) during installation. After the final version is installed the patch should be re-run. After the patch has been successfully applied, the welcome message in the console will begin “You are playing version 3.01 final”. Hey buddy if u see this, I loved ur mod, but i’d like to ask you if you have a patch fix for the DUST1 AND DUST2? maps that I couldn’t played I was kicked out to the desktop when trying to charge them, so please I kindly hope u could check tahat issue! Indeed a lot of work has been put into this mod. But, after concluding 5 missions, I just noticed It’s boring as hell. No hard feelings, but It’s always the same thing, only killing and etc. I like variety, so I highly recommend this mod to super duper shooter maniacs. But still, I give it a Play It Now, because these 5 missions I’ve played were very fun, but the rest, is just the same thing. Indeed a lot of people will disagree with me. This page contains spoilers, but will help if you are stuck in Aztec, Xmas, Chateau, Forest, Venice or Rush. I am stuck in de inferno unable to shoot down the chopper. any ideas somebody? First you need to find the rpg, which has in target area A. You can then make use of the rpg ammo which has been stashed in various places around the map. Once you have the rpg you will also then have a rebel assistant, who will supply you with rockets until the helicopter is destroyed. If the rebel is killed another will take his place. Funnest Mod I have ever played so far. Love the new weapons too! I picked up CSS a month ago during a promo, and just installed CSS Hardwired. Tried to enter the weapons room in the game lobby, and my machine crashed hard. No weapons training for me, I guess! Here’s hoping I have better luck down the road. 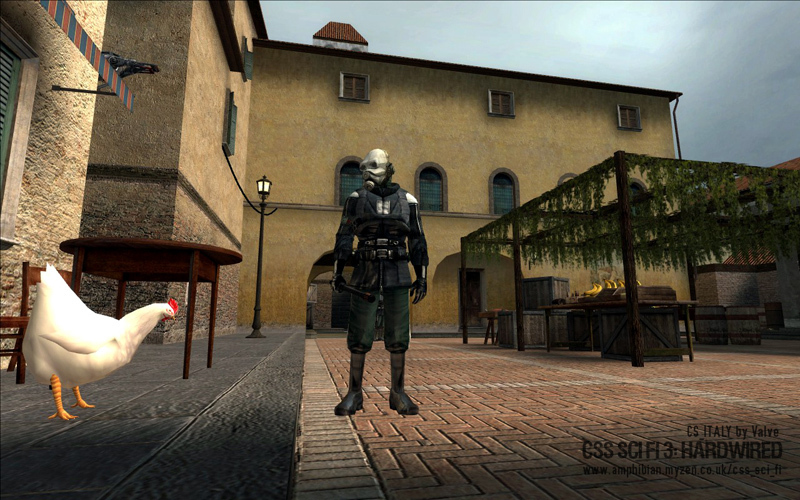 You need to start CS:S to the menu screen at least once prior to running the mod – if you haven’t done that then do that first. It sounds like the game is crashing at an autosave, as there is one right before the entrance to the shooting range. You can disable autosaves if they are a problem for your computer (disable_autosave 1 in the console). You may also want to follow the recommendations at Steam support https://support.steampowered.com/kb_article.php?p_faqid=397 for general game crashes, as you may have a problem with your system memory. This was certainly one of the best and most fun things I’ve ever downloaded. I’m very glad that I bought CSS when it was cheap a few months back (when I still had money 😉 ) so everything is available to me. I did have some trouble with one or two maps, I attribute that to me not knowing cs at all. But I love that they’re little short vignettes and you can drop into one, play a short time and then log off without feeling like you’re pressed for time. This is the second time I have installed the mod… and the patch… and ONCE AGAIN the game crashes farely at the beginning resulting in screwing up my mouse sensitivity for my entire PC. Now, don’t think I’m stupid. I’m doing nothing wrong and it is in fact the mod and not anything else. I deinstalled the mod and also tried the system recovery, but no. Everything fails. I don’t know whats going on, but I suggest trashing the coder of this thing. The mod itself is good. Nice idea and its challenging, but I DONT KNOW WHAT THE HECK IS GOING ON. There’s nothing in the mod or the installer that could do what you’re describing. The only thing I can think of is that perhaps you don’t have Counter-Strike: Source installed. Steam will cause problems if you try to mount content you don’t have. Or, you had some kind of problem installing the Source SDK base, which is downloaded by Steam automatically when the game is first run if it is not already installed. I can look into it if you send me your install log (..\SourceMods\CSS SCI FI\install.log). It wasn’t the installer. It was the game sometime after I started it. It crashed to the dekstop with some kind of link error. It was too fast to be seen. Then my mouse sensitivity was screwed and I wasn’t able to restore it in any way. Also in TF2, the usual movement of my hand would result in a 180 degree turn. After the crash I would make a 360 degree turn. And generally now, the movement is slightly to strong and unpredictable. It feels sorta loose and I know it cause I have a specific sensitivty I have gotten used to over a long time. That was the first time. And it resulted in the EXACT same manner as the first one. That can’t be a coincident. However, I’m going to my friends house now to get an external hard drive to secure my files. Like I said in my first reply, there’s nothing in the mod that could do this. It includes no settings for the mouse whatsoever other. If you want any further assistance, don’t reply here – email me with an install log and a console log as described here: http://www.amphibian.myzen.co.uk/css_sci_fi/#contact under error reports. Well, I’m sorry. Out of anger I removed anything that ahd to do with the mod. However I think I owe you an excuse for posting this stuff here. I wanted to remove my recommendation image, but I’ve seen you have already done so. I only hope other users don’t get this problem. I also won’t be replying here anymore as you wished. What the hell? Every time I play the game, it crashes on me. First in the weapons area in the Hub, after which I applied the patch. Then it crashes as I open the door in the very first area. Then, it crashes in the very first loading screen. What’s going on? Strange. Do you have CS: Source installed and run at least once? Yup. Installed, almost certainly ran it before installing, just to be safe I ran it after having this problem, and it still persisted. You did install it with the executable, not by copying a folder over, didn’t you. if you did, then I am out of ideas. All I can suggest is to visit the homepage and under credits is a section called Error Reports. Follow the instructions and I am sure the author will help you. No problem, I’m just glad someone responded. I’ll try reinstalling it and if there’s a problem I’ll send an error report. Thanks. A new version of CSS SCI FI 3: Hardwired is now available. This is the complete cumulative file containing all the fixes from the 3.01 patch, plus many new refinements. * Mission briefing now appears after the first autosave of each map, so that the mission objectives and hints can be reviewed when a map is restarted from the autosave. * Added an autosave to the hub when returning from single missions. Players can now rely on the this save to return to the game between sessions. 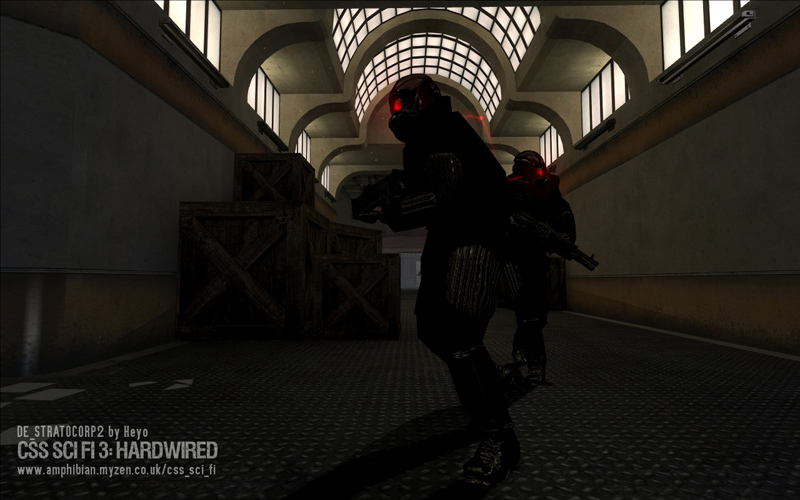 * Minor gameplay improvements to Compound, Inferno, Italy, Piranesi, Tides, Battleship, Spirits, Thunder and Stratocorp. Minor efficiencies added to all scripts. * Removed option to limit player to 10 weapons (caused problems in several maps including the mission hub due to weapons stripped not being deducted from the player total, so that weapons could be lost but new ones could not be picked up). 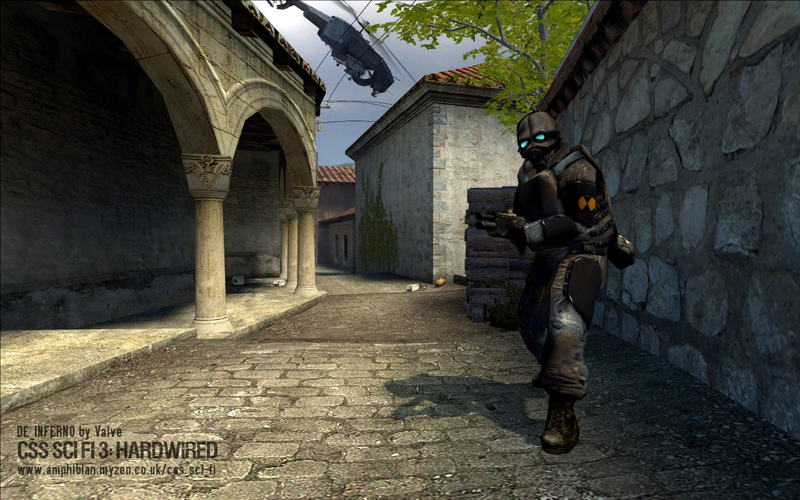 * Replaced option for vector crosshair with a simple fixed crosshair without a reticle. * Removed Combine health increase from “Extreme” difficulty setting to make this option more playable. This setting works well when combined with the easier in-game skill options, so that enemies can be killed quickly, but are aggressive and very accurate. * Includes fixes from 3.01 patch (Aztec fix). * Added a big icon for the new Steam library window. A patch for previous versions (3.0 Final (2009-10-23) and 3.01 patched (2009-11-08)) is available here: http://www.moddb.com/mods/css-sci-fi/downloads/css-sci-fi-3-hardwired-patch-30301-302 For any other earlier version download the full version above. You do not need this patch if you download the full version above. Im getting an error when I want to launch the mod, it says, “Failed to load the launcher Dll” what should I do??? If that doesn’t help, search Google for your exact error message – seems to happen when Steam can’t find the correct executable, but validating should correct this. 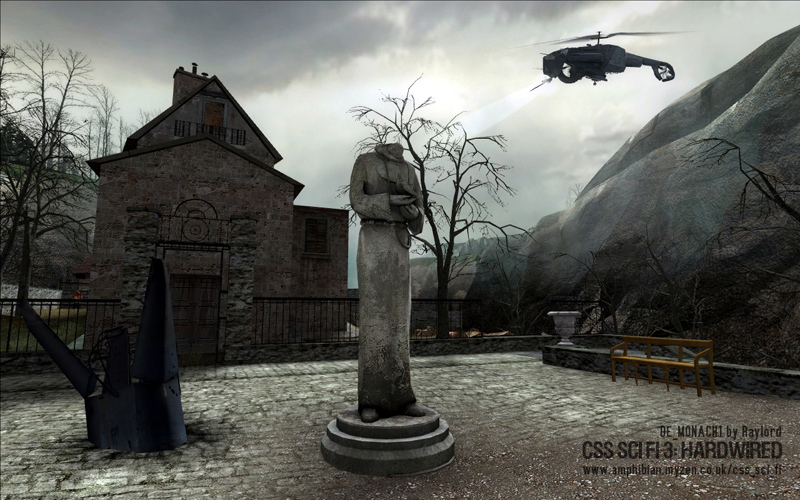 Fantastic – always enjoyed playing CSS, and often wondered what some of the maps would be like wit a few Combine and zombies instead of human opponents. The level switching system is a brilliant concept – As I have a fairly frantic lifestyle, I find it helpful to be able to ‘drop in” to a map whenever I get ten or fifteen minutes to myself, which isn’t often! Well, this mod had 9 recomendations by the time I was writing this, now with my recom” are 10! yep, this mod is so worth it, defenetly one of the best and a MUST PLAY IT!, if you don’t have Counter Strike Source, get a debit card and purchase it inmediately from steam!, I have to say that this magnificent mod was the main and only reason for me to purchase Counter Strike Source, and guess what? I am not regret it at all, this mod was a god’s delight to play!! I mean it. Great maps, most of all were awsome. This mod shows all the big potential that source engeine has to create awsome dimond mines as this mod is. 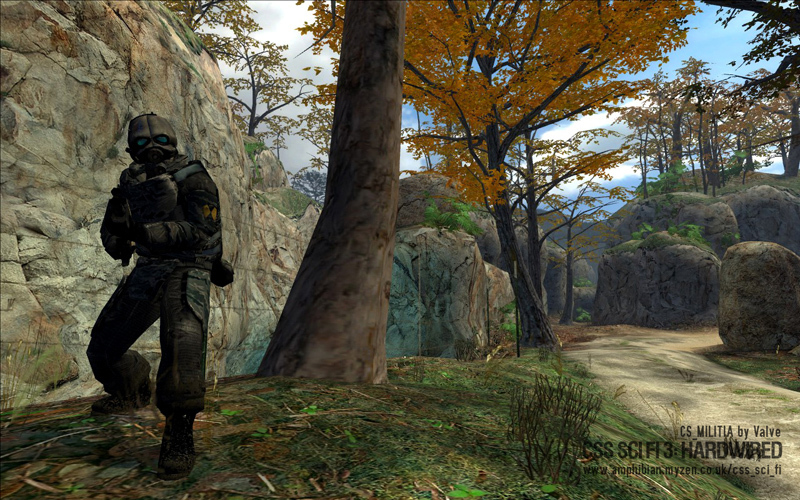 I love play all the CSC original maps in a extreme SP experience, I have to say that I don’t get used to play MP mods or games, “cause im terrible on them I get killed in tnhe 2nd second I enter the game and then the same in the bloody respawn!!!!!! !, so CSC compensed those terrific maps in a wholy SP experience for me,, altough I couldn’t play the DUST1 and DUST2 maps I think that for a buggy reason, I didn’t care because every other map I played was defenetly worth it! So finally, please don’t hesitate to play this jewl. 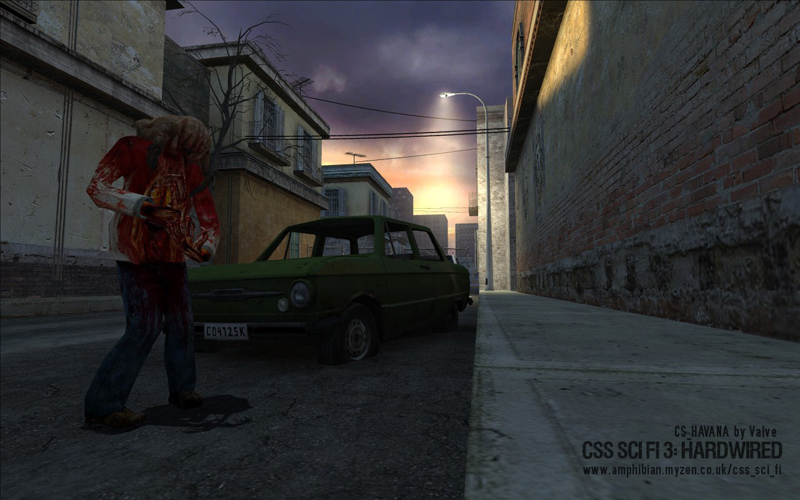 Love the improoved efects, the optional setting for the game, see lot’s of blood comin” out of those hated cmb ennemys and their freakin bodies explode as the old days in HL1, also absolutely loved the new weapons smart fited in the mod, love the sniper riffle and the classic AK47, that i’d like to play in almost all maps with it. As a Previous poster said..”boring”. rescue hostages,destroy something…over and over again. A critical patch for CSS SCI FI 3: Hardwired is now available. 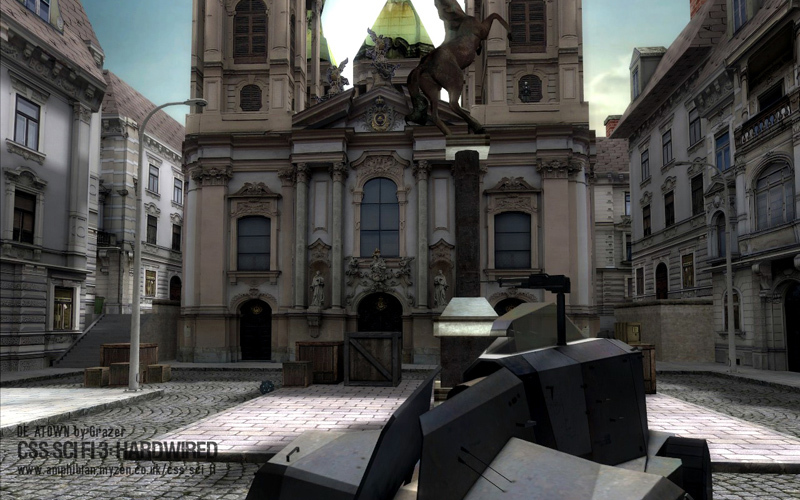 This patch fixes fatal incompatibilities in the retail maps DE_Dust, DE_Dust2 and DE_Inferno. This patch is required for all versions, including 3.02 complete. Awesomeist mod! I know “awesomeist” is not a word, but who cares at this case? 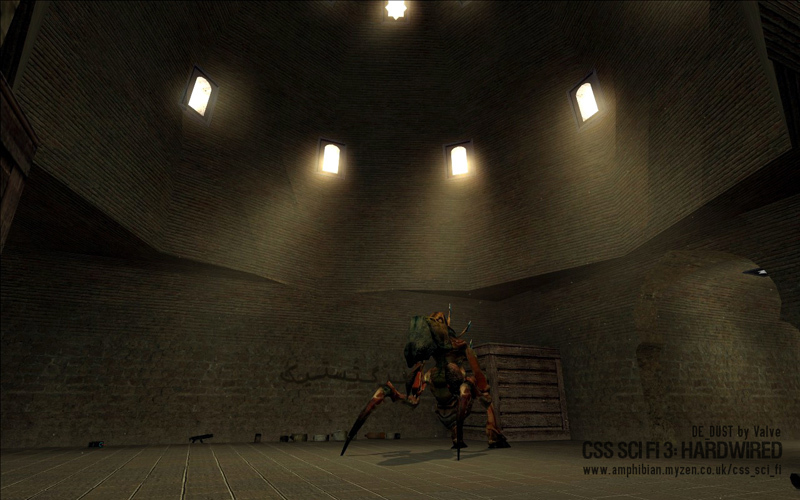 Just imagine playing CSS but with HL2 enemies in it! I bet Day of Defeat: Source is next! The creators of SMOD really know how to make fun mods with fun new weapons and enemies! It would be better if EP1 and EP2 enemies were in it, but no matter! Possibly they might make a remake, who knows? 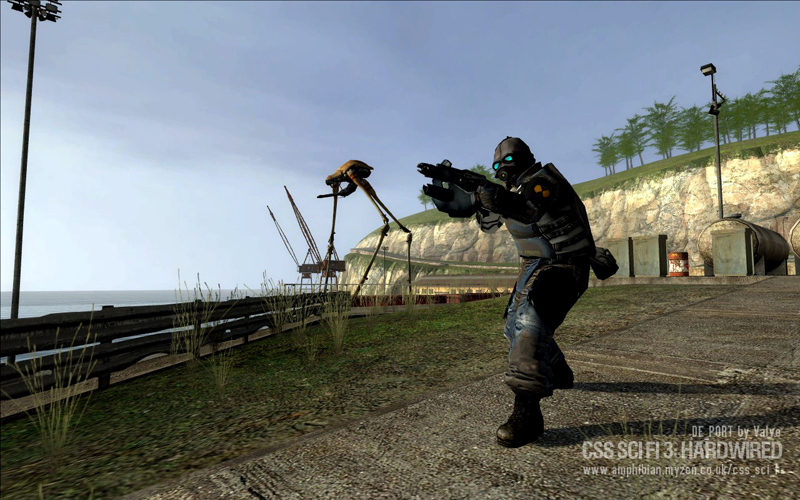 EDIT: Why do people keep saying mods are set in the HL2 Universe? They are not, unless they are made by Valve, this is not HL, this is what the name of the mods are. Well, that’s my opinion. Thanks for your comments and review. It’s an interesting point, the universe identified as the setting for the mod. When people talk about mods being set in a particular universe, they mean that the game takes place in the same “world” as the original game. This is distinct from setting mods in the same canon storyline, which, as you say, only Valve can control. 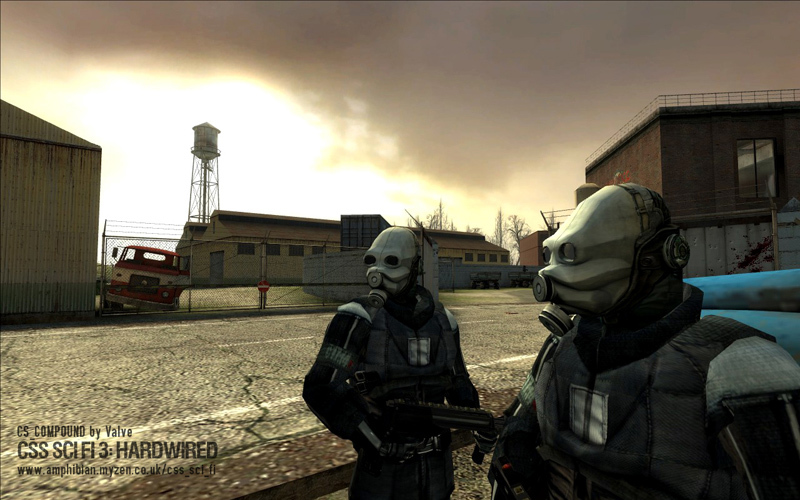 So, in this mod, for example, it’s the HL2 universe in that the Combine are the enemy, rebels are your allies, the weapons behave as expected and it all generally has something to do with battles taking place on Earth against a backdrop of inter-dimensional warfare. 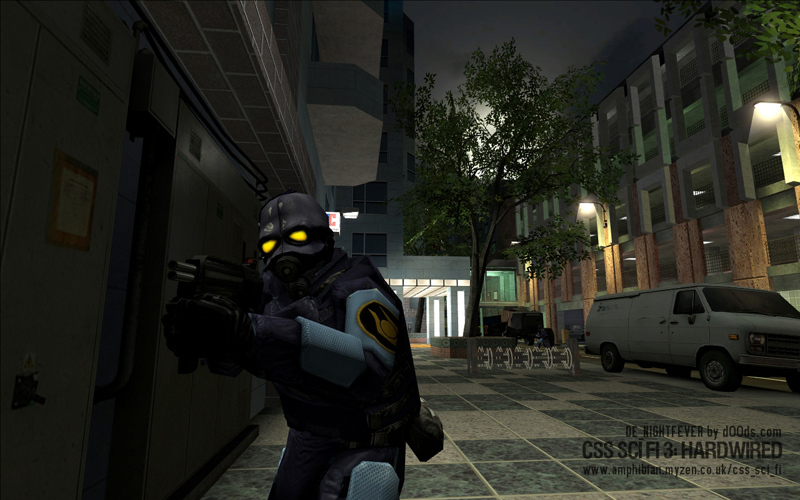 However, it’s also not the HL2 universe in that the constant reappearance of allies with the same faces, the player’s ability to die and re-appear at will, and the ability of Barney and Alyx to be killed over and over are all explained as the result of a mysterious cloning operation taking place in a seemingly abandoned and improbably well-stocked dimensional portal facility. So it’s a mixture of the HL2 universe and another universe close by. This is by far the hardest mod I have ever played! The missions are well designed and the new weapons and effects are amazing, but the combat is at a level many times more realistic than I am used to in the HL universe! It may be my set up is too advanced for my combat abilities but I will persevere and hopefully prevail! At this level I would never have got over that “Strider Mountain”………. Maps usually take 20 minutes, so great for a quick game. Good variety and design. The final map is ridiculously hard and I gave up; even in God mode it took ages to down the gunships because the RPG’s are mostly duds. where is the download link / area for this mod??????????? should have been before the screenshots and the ratings. Yes, this was to do with the move to a new host and an error with the format of the database. It’s a huge amount of work for me but I promise to fix it soon. Wait, are these for realsies?!? Played this a very long long time ago, and liked it. Now, I’ve been desperately trying to find methods on how to install it. Shame that this got discontinued. This is excellent, I really wish the modder updated it. Hell, I’d pay for a standalone edition on Steam. Its has this drop-in-drop-out feeling that I like and combat scenarios that are interesting and challenging but never overwhelming, balanced by the new tools and abilities at your disposal. Basically, if you love HL2’s combat mechanics (I do, non-regen health, with a nice ample health pool, and 360 degree sprint) and want more of it, here it is. OMG I love this mod. IT’s the primary reason why even bothered installing Steam years back when Valve haven’t broken it bigtime. I love this mod not bec. 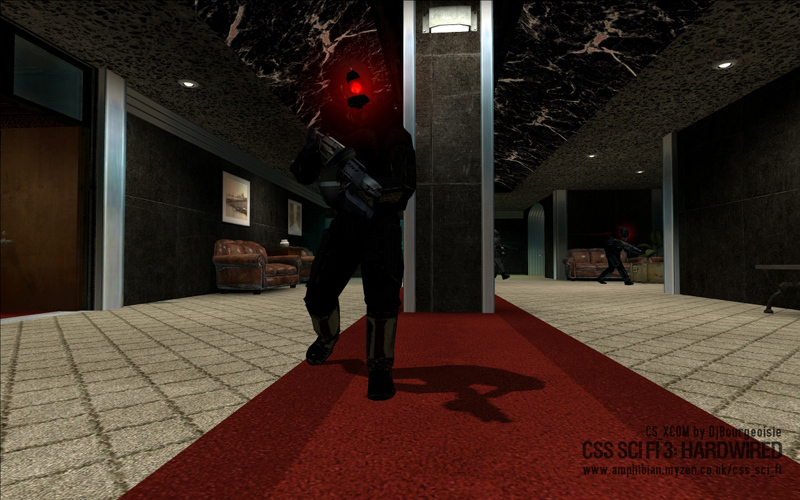 of the CSS mp maps converted to sp maps but because it will let me play the HL2 campaign using aimable iron sights + 30 custom weapons from CSS and DODS which I went crazy modding and scripting the weapons and made my own home made CSS SCI FI standalone so steam can no longer destroy it when it updates the darn engine hehe! And this mod is basically a mod within a mod….this is just a heavily modified SMOD but with super high quality map adds but still using the boring smod weapons….I even played G-string using this mod hehe. Too bad it does not support ep1 and ep2 but there other mods for those anyway. will this work with counter strike source? I installed the package and the open works fine, but when the play maps open it’s hexes and errors. TSRH. I installed it, and I get a black screen when I initiate a campaign. The links at the top are all dead, except the download. So, am I screwed? Or is there a fix for this? Good luck. If any of the links there are dead let me know, I still have the files. The Recommendation Image has been removed because the review was too short. Let me apologize for short *review*, and thank the author of this mod for long hours of fun. This mod in many ways has spoiled many other mods, because it had little features that I got to miss in other mods, like the fact that you could pick around the corner with out alerting enemy, or helping your team keep alive, or giving them better weapons and you can kick . It helped me to be creative, and playing it over and over with different challenges, really cool. I am new at all this so I don’t know much, I do know it is a pain to install it, but it is worth it, and truly would be a shame for this mod to be lost in time. So I still say it is Awesome. I directed the second part of the install to Steam/Steamapps/Common/Counter Strike Source, which is where Steam put it, a fresh [today] reinstall. This is NOT where the installer expected it to be, and gave me multiple warnings I might be installing to an incorrect address. So I am hoping this is the right place for it. Now to go get the patches. Oops, link to the first patch listed above is dead. So I am going to uninstall and start over using TolisXTRM’s guide, and see where that gets me. Hey! So I saw your comment and I just wanted to say, if you have any technical problems, then you can add me on Steam so we can figure it out. Have a nice day! Got it installed and running using a guide posted on Steam by Pigfaced. Yeah this mod is tough to get working these days. Did you follow the guide on steamcommunity linked just a couple comments above?